At increasingly multicultural and international communities, increase of cultural frictions is an issue. Through foreign language learning, students now need to gain ability to advocate their ideas without causing cultural frictions often triggered by offensive or insensitive speeches. 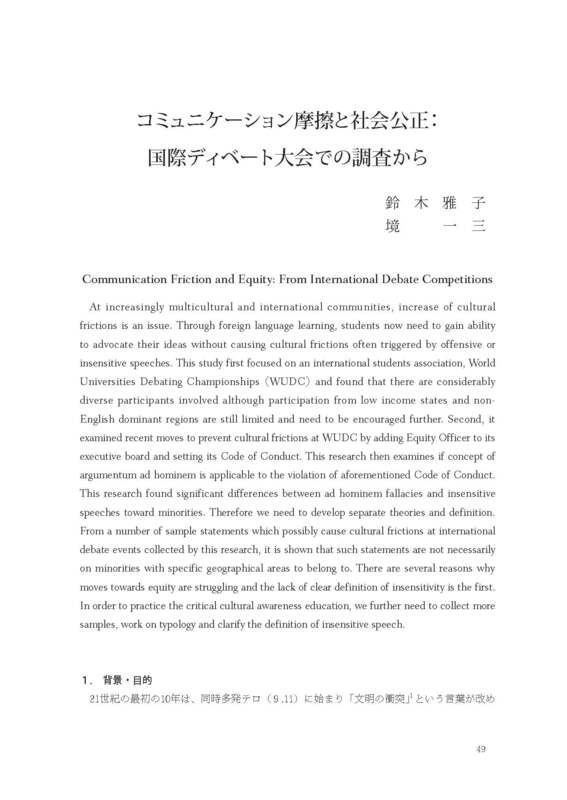 This study first focused on an international students association, World Universities Debating Championships （WUDC） and found that there are considerably diverse participants involved although participation from low income states and non-English dominant regions are still limited and need to be encouraged further. Second, it examined recent moves to prevent cultural frictions at WUDC by adding Equity Officer to its executive board and setting its Code of Conduct. This research then examines if concept of argumentum ad hominem is applicable to the violation of aforementioned Code of Conduct. This research found significant differences between ad hominem fallacies and insensitive speeches toward minorities. Therefore we need to develop separate theories and definition. From a number of sample statements which possibly cause cultural frictions at international debate events collected by this research, it is shown that such statements are not necessarily on minorities with specific geographical areas to belong to. There are several reasons why moves towards equity are struggling and the lack of clear definition of insensitivity is the first. In order to practice the critical cultural awareness education, we further need to collect more samples, work on typology and clarify the definition of insensitive speech.